Hello friends! Here’s a recipe I’ve been wanting to make for you for a long time. It’s simple, it’s tasty, and you can easily make a non-dairy version of this if you have dairy allergies. 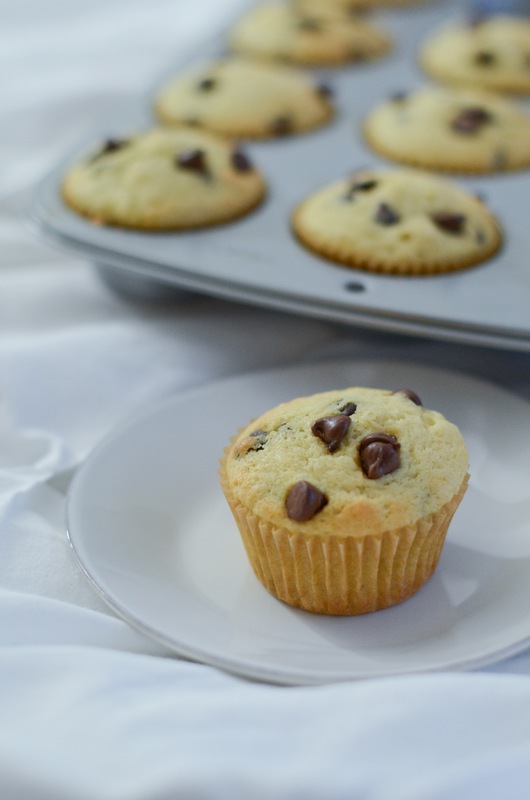 This is my Chocolate Chip Muffins Recipe made with almond milk. 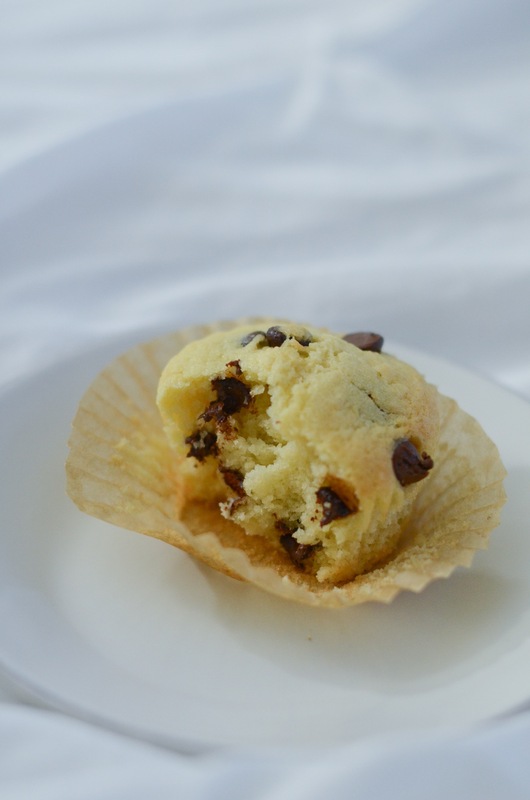 My original idea was to make a vegan chocolate chip muffin recipe. There’s an amazing vegan chocolate chip muffin at Earthfare that I used to love to get for a decadent breakfast. I knew I wanted to re-create it. My first attempt was a fail. Somehow the chocolate chips all ended up at the bottom of the muffins. Not ideal. It was like a thick layer of chocolate at the bottom and then plain muffin on top. My guess – the batter was too liquidy. So this time, I made sure to make a batter thick enough to hold the chocolate chips. I also reserved some of the chocolate chips to add on top. The plan worked! The chocolate chips were evenly spaced inside. And then you get the bonus of a couple more on top. Woop! I think I can still accomplish this with a vegan version of the recipe. I had planned for this recipe to be vegan. When I had time to try again, I had almond milk, but no vegan butter alternatives. So, I decided to use regular butter and eggs for now. But I have plans to create another version that is vegan. And possibly also made with whole grains. Or maybe there will be a few versions of this recipe. I’m thinking one can’t have too many chocolate chip muffin options. But maybe it’s just me? 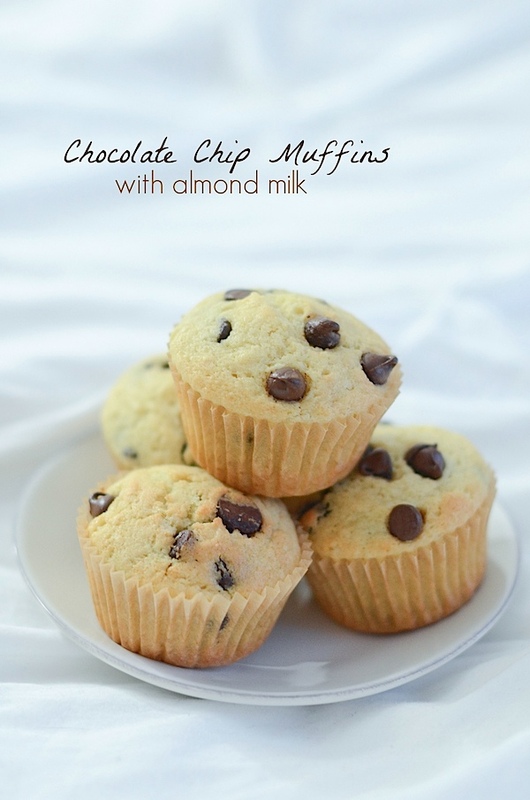 For now, we have this version – Chocolate Chip Muffins Recipe made with almond milk. If you’re in a pinch, you should be able to easily substitute Earth Balance for butter and use flaxseed eggs in place of regular eggs to make this vegan. But, I’m hoping to have a full recipe for you soon. 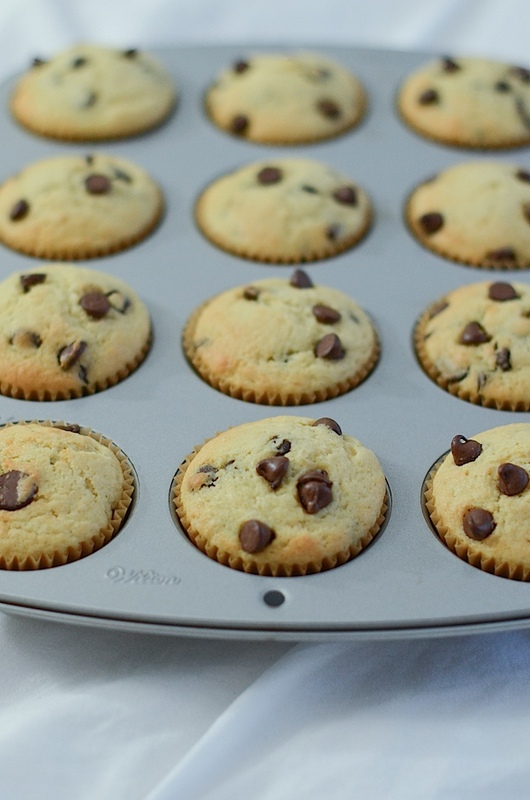 Here’s a super simple Chocolate Chip Muffins Recipe made with almond milk. The whole recipe can easily be made non-dairy by making a couple easy substitutions. 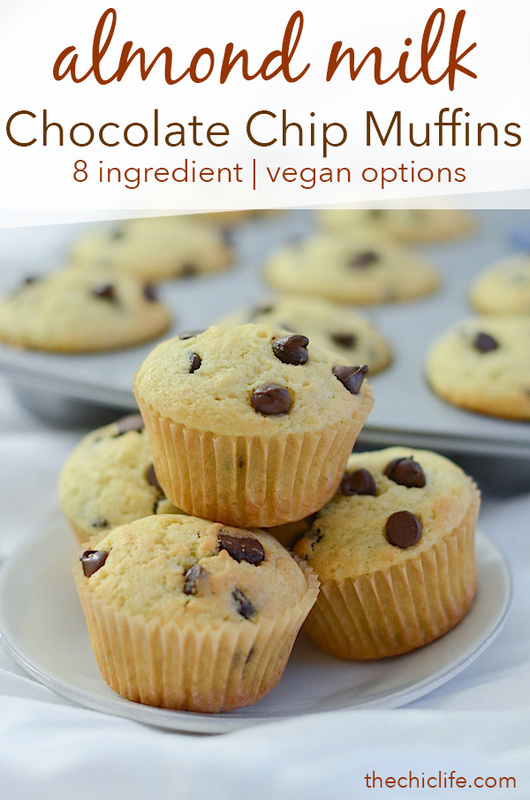 Use vegan chocolate chips and flaxseed eggs to keep this recipe vegan. Happy baking! 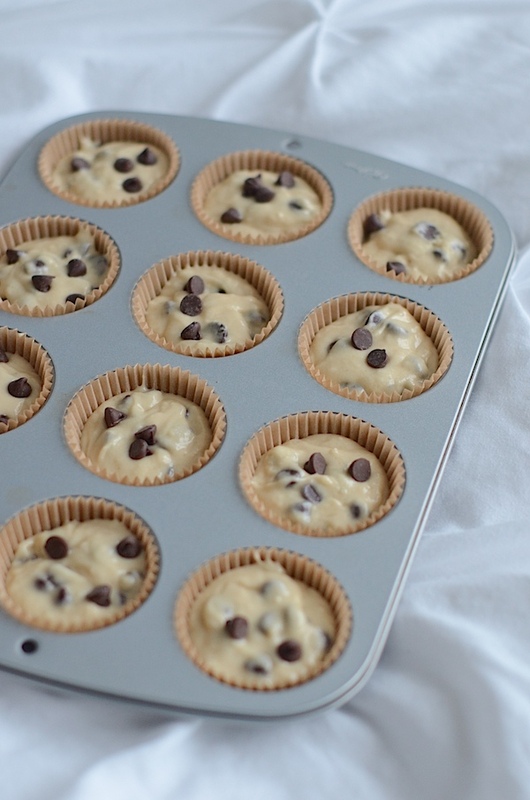 Pre-heat oven to 350 degrees F. Prepare a 12 cup muffin tin with unbleached paper cups. Combine dry ingredients (flour, baking powder, and salt) in a large bowl and whisk together until evenly combined. Stir in chocolate chips. In a large bowl, mix butter and sugar until evenly combined. Note: It will resemble coarse sand. Stir in eggs. Whisk in almond milk until evenly combined. Stir wet mixture into dry. Evenly distribute into the prepared baking tin. 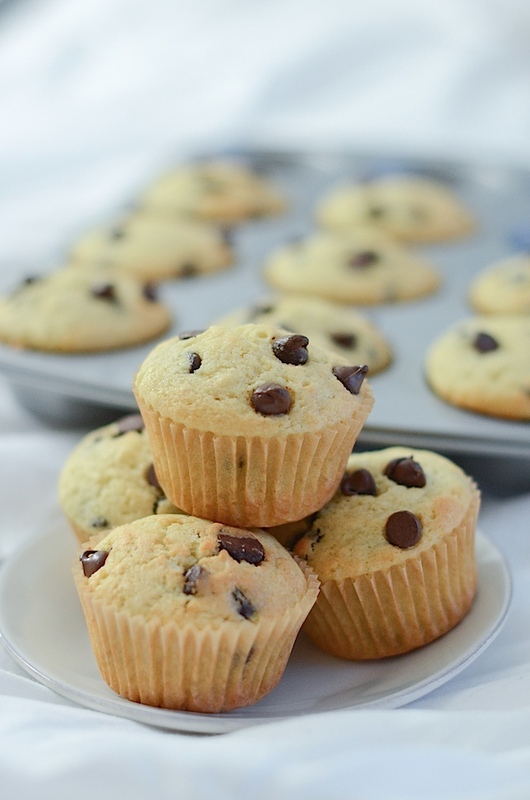 Top muffins with a few chocolate chips. Bake 18-22 minutes or until muffin tops are just turning golden brown or until they’re cooked through. To test, insert a toothpick in the center of a muffin and remove. If the toothpick comes out clean, they’re done. If wet batter is stuck to the toothpick, you may want to add another minute or two and check again. Cool until safe to eat and enjoy! 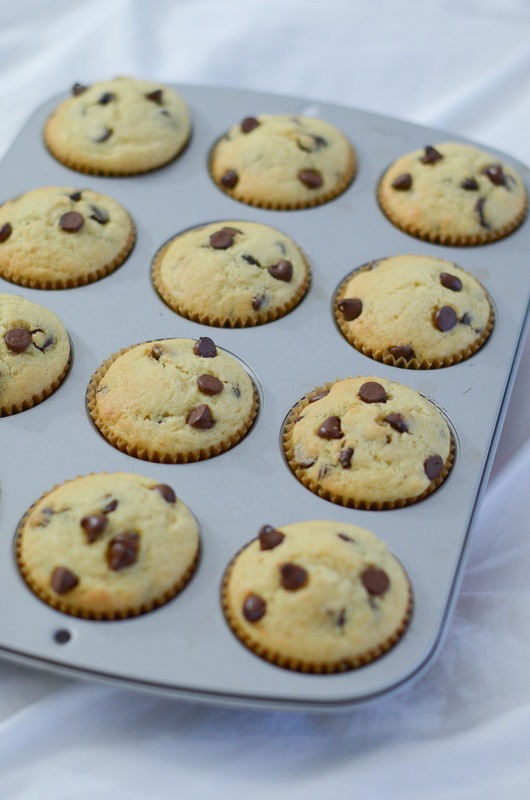 Note: Stirring chocolate chips into the dry mixture will help them keep from sinking to the bottom of the muffins. How about some healthy Blueberry Streusel Muffins. Sounds fancy, but so easy! Looking for something more unique? Try my famous Green Monster Muffins. Or try this Healthy Cinnamon Apple Muffins recipe. 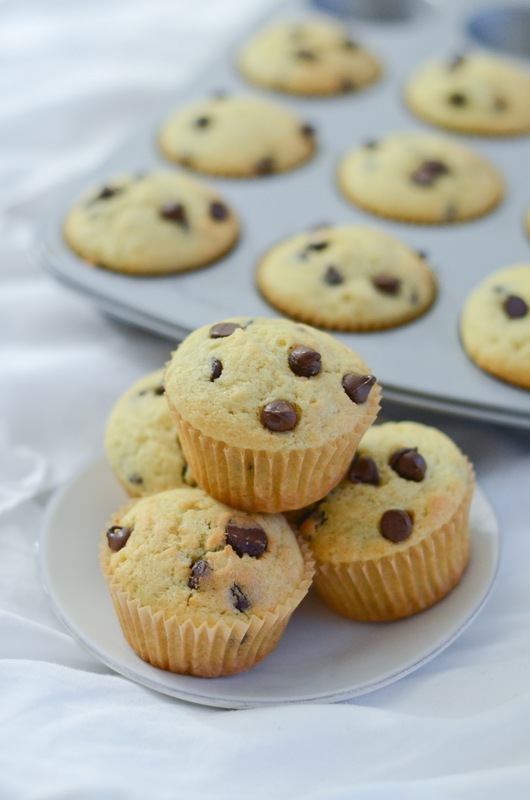 Click here to check out my other muffin and bread breakfast recipes. Hope you enjoy this Chocolate Chip Muffins Recipe made with almond milk. Happy baking! do you have an estimated cook time? HiJamie! Oops so sorry about that! I had the overall estimated cook time in the recipe, but not in the step-by-step directions, which is where it really should be. Thanks for letting me know it was missing! The estimated bake time is 18-22 minutes. 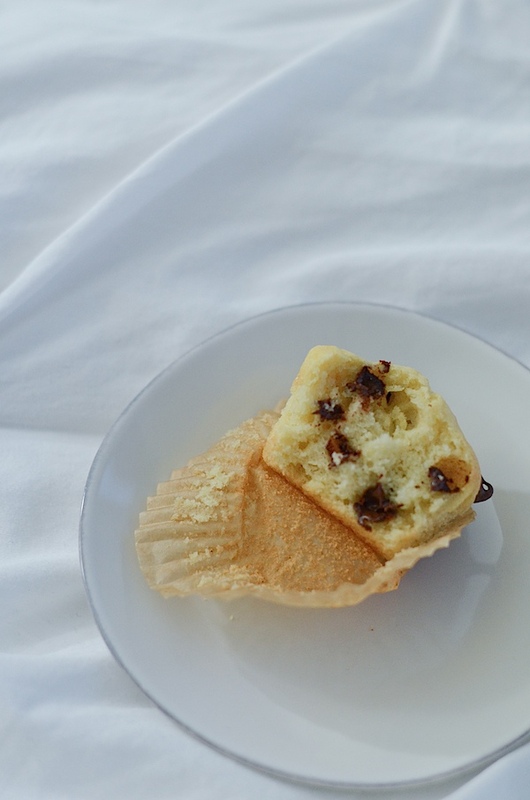 Let me know what you think of the muffins if you try them. 🙂 Cheers!